Adding lighting to the landscape is a finishing touch that brings a pizzazz that is hard to match in any other way. 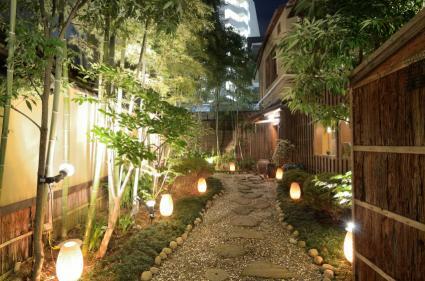 It creates wonderful nighttime ambiance in the garden and - in the case of path lighting - is important for safety purposes, as well. Solar-powered path lights are an instant fix when you need pathway lighting, but can't be troubled with installing a full-blown, hard-wired system. It's as easy as going to your nearest lighting supplier, picking out the style that suits you best and placing them where needed. Most models have a stake integrated with the light fixture that allows them to simply be pushed into the ground - that's it, installation finished. Every imaginable style is available from rustic metal fixtures to sleek modern shapes and Zen garden designs. Some have a tiny solar panel built directly into the light fixture, while others come with a detached solar panel that powers a string of lights. If your path is in a shaded area, you'll want to go with the latter and make sure that the cord supplied is long enough to reach from where you want the lights to the nearest sunny place that a solar panel can be conveniently mounted. 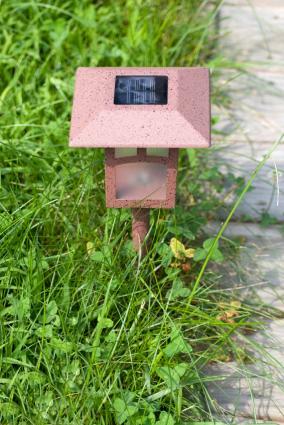 The disadvantage of solar-powered path lights is they do not shine as brightly as those that are connected to the house wiring, but often a faint glow is all that's needed to prevent a tripping hazard and guide visitors to the front door. Clean off the solar panels periodically to keep them operating at their maximum. Home Depot sells 10-packs of metal solar path lights for just under $50. They are wireless and provide eight hours of light on a charge. If you need to illuminate a path in a shaded area, try a string of five lights with a detached solar panel from Wayfair for $80. Without a solar panel, path lights must be connected to an exterior electrical outlet. They can be tied directly to a circuit in the house, but that's a job for a licensed professional. If you have an exterior outlet, however, it's a straightforward job to install path lights. They are often run on a 24-volt circuit which is made with a special transformer box that typically comes as part of a lighting kit. The transformer is weatherproof and plugs directly into an exterior outlet that feeds power to a string of lights. Often, the system is designed so that the lights can be placed at any point along the line that is desired. A little clamp is used to pierce the electrical wire which then connects to the light fixture via a short lead. The mainline is designed to be buried directly in the ground - a depth of at least six inches is recommended to ensure that it will not be pierced by a shovel; call 811 before you dig anywhere. It gets a little tricky when you need to cross a path, so it's best to avoid it and use two strands of lights instead. 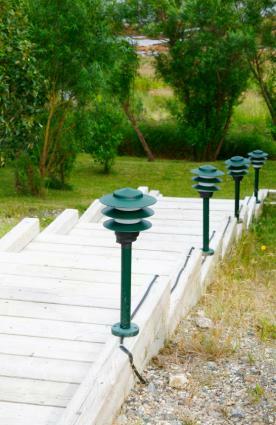 For a 120-volt system, Lighting Direct offers quaint three-louvered, green metal path lights for $27 each. If you're on a budget, Target has a great deal on strings of 10 plug-in path lights for only $20. 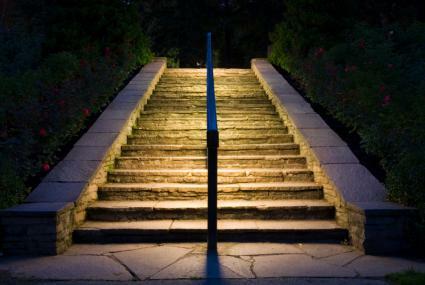 Path lighting comes in more than just basic solar or electrical stake options. Garden paths are often bordered by walls, fences and railings which provide other opportunities to customize your lighting design. There are many fixtures available that are designed to be mounted on one of these structures, bringing the lighting off the ground and integrating it with the hardscape. This can take the form of lamp post fixtures that protrude from the object, or you can consider concealed fixtures that are mounted discretely inside of a railing, retaining wall or an overhead structure, such as a pergola. It's also possible to integrate lights in the pathway itself. These are referred to as paver lights or well lights, because the bulb is housed in a fixture that extends below grade with a covering that is even with the path surface. These can be integrated into any type of path, but are often used in conjunction with pavers, as they fit seamlessly in the space that would otherwise be occupied by a paver and can be walked on just like the rest of the surface. One common variation on the theme are the special light fixtures that fit flush inside the risers of a set of stairs, making sure that each step is well-illuminated for safety purposes. LED lighting is becoming more and more common as it uses a fraction of the electricity of incandescent bulbs. LED bulbs cost more, but they last much longer than conventional bulbs - so in the long run they are much more cost-effective, especially when factoring in the cost of electricity to run them. The main disadvantage of of LED bulbs is that they give a 'cool' light, rather than a rosy, warm glow. However, for the sake of energy conservation, they are becoming the new norm in outdoor lighting. Amazon.com offers a three-pack of wall-mounted solar-powered LED path lights for just $30. Kichler Lighting Lights sells a neat path light that can be mounted on a railing post, retailing for $75 each. If ultra-modern is your style, Hinkley Lighting Lights has some great options, including an unusual L-shaped model with titanium housing and etched glass covers. They are pricey, however, retailing for $100 each. 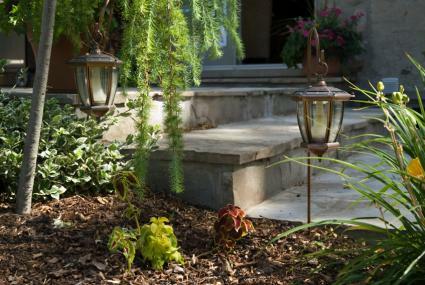 For an Asian-inspired landscape, Affordable Quality Lighting sells pagoda path lights. They sell between $30 and $60 each, depending on the design you choose. You may also want to consider a contemporary bollard-style (post-mounted) path light, like those by Kichler for $332, available through Build.com. Path lights make a landscape feel polished on complete - they are the cherry on top, so to speak. Take your measurements, head to the store or Internet and revel in picking out just the right lights to complement your garden design.